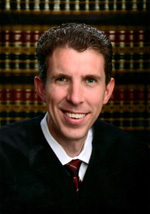 Justice Hoffstadt is a third-generation Southern Californian. He grew up in the eastern San Gabriel Valley, and attended public schools from kindergarten through law school. In 1992, he graduated from Cal Poly Pomona with a degree in business administration. Three years later, he graduated first in his class from UCLA School of Law. Following law school, Justice Hoffstadt spent two years as a law clerk—first for Ninth Circuit Judge Cynthia Holcomb Hall, and then for Associate Supreme Court Justice Sandra Day O’Connor. For the next three years, he held legal policy posts at the Federal Communications Commission and the U.S. Justice Department’s Office of Policy Development, both in Washington, D.C.
Justice Hoffstadt returned to Los Angeles, and joined the U.S. Attorney’s Office as a criminal prosecutor. He spent the next six years investigating, charging, and trying criminal cases involving everything from white-collar fraud and international extortion to computer hacking and trademark infringement. He also served in the Criminal Appeals section, where he regularly briefed and argued appeals before the Ninth Circuit Court of Appeals. He then entered private practice as a partner at Jones Day. For the next three and a half years, he helped run the Issues & Appeals practice group in the law firm’s Los Angeles office. In that capacity, he briefed and argued complex trial court motions in civil cases, and briefed and argued civil appeals and writs before the California and federal appellate courts. In 2010, Justice Hoffstadt was appointed by Governor Arnold Schwarzenegger to the Los Angeles Superior Court. He presided over criminal and civil calendars, preliminary hearings, and civil and criminal bench and jury trials. He also served for a year as a pro tem Justice in Division Six of the Second District Court of Appeal. Justice Hoffstadt was nominated by Governor Jerry Brown to Division Two in 2014. He was unanimously confirmed by the Commission on Judicial Appointments, after receiving an “exceptionally well qualified” rating from the Judicial Nominees Evaluation Commission. Justice Hoffstadt has devoted many years to teaching. He has taught as an adjunct professor at USC School of Law, Loyola School of Law, and George Washington University Law School. He has also taught judicial education courses all over the State of California on evidence, habeas corpus, domestic violence law, arbitration, civil jury instructions and verdicts, and criminal law. He has been a faculty member of the Judicial College since 2012. He has moderated or participated in panels for law schools and bar associations; lectured and judged moot courts at high schools and middle schools; and taught a segment of a bar review course for would-be lawyers who seek careers in providing public access to justice. He currently serves on the Board of Directors of the Appellate Judges Education Institute, and on the Executive Committee of the Appellate Judges Conference of the American Bar Association’s Judicial Division. He will be chairing the 2017 Appellate Judges Education Institute Summit. Justice Hoffstadt has also written extensively. He has published articles in the UCLA Law Review, Duke Law Journal, Texas Law Review, Northwestern Law Review, and Southern California Law Review. He regularly writes for the Daily Journal. He is the author of California Criminal Discovery (5th ed. 2015). Justice Hoffstadt is married to a public middle-school English teacher. They have two children under the age of five.